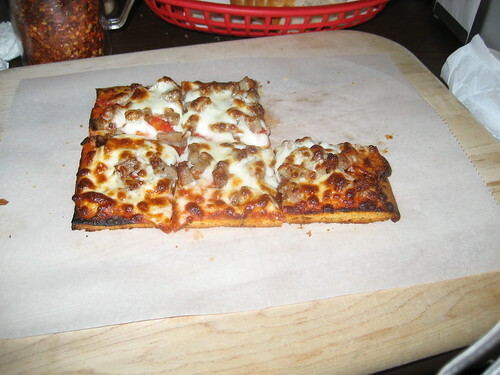 This is a slice of sausage pizza from Pizza Metro. I think I paid $2.85 for it. It’s a decent size, but not huge. It followed the pre-meal cappuccino that I talked about a few days ago. And right on its heels was a post-meal cappuccino. That, my friends, is known in my brain as the cappuccino-pizza-cappuccino combo (CPC combo). First, the pizza. What they do here for the by-the-slice pizzas is have a few sheets of crust already half-made. Upon your order, they add the sauce, cheese, and other toppings and heat it up. It takes about eight minutes. I love the way they cut it into the six mini squares. I usually take about three bites for each square. It’s a joyous piece of pie. Quality ingredients all the way around with a tangy sauce. Now, let’s talk about the post-meal or dessert cappuccino. If you recall, the pre-meal cappuccino went down unsweetened. Not so with this one, I use two solid spoonfuls of sugar (it’s kind of a small spoon). I stir it in nicely so that I have frothy, sweet, espresso flavored, warm shake-like drink. What a capper, no pun intended, to this Italian feast. You’ll see more from this place because their menu is massive and I aim to try it all. My wife usually gets the minestrone. You should see how they make that. No pre-made vat of minestrone at this place. The break out a small skillet, pour in some stock, throw some veggies and beans in, then just heat it up right on the stove. Good stuff. All in, my cappuccino-pizza-cappuccino combo meal was $7.85 before tip. Do you believe that? That’s living the high life my friend, living the damn high life I tell ya’! Posted in food on 2007/02/08 by John.